We get the dance floor shaking! Front page of "Arlington" section of newspaper. Island Boogie can do that Latin flavor! Hot diggity! A One O'Clock conguero! 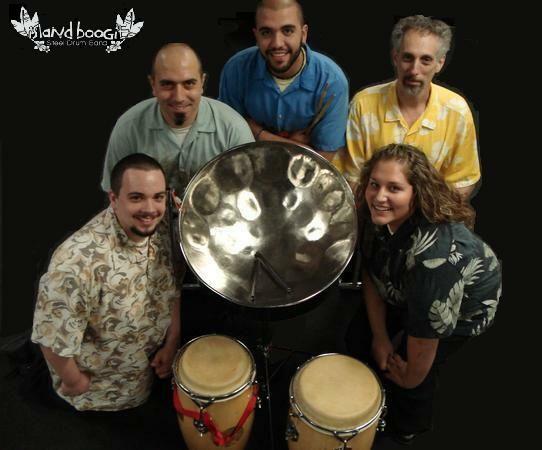 "HOT Caribbean Rhythms & COOL Tropical Grooves"
The perfect solution for your special engagement or themed event, Island Boogie can infuse any setting with that warm tropic sizzle! We serve the finest Caribbean entertainment in the Dallas-Fort Worth metroplex, offering many packages--with or without a singer, from a solo steel drummer to a 10pc island party band--for every occasion. 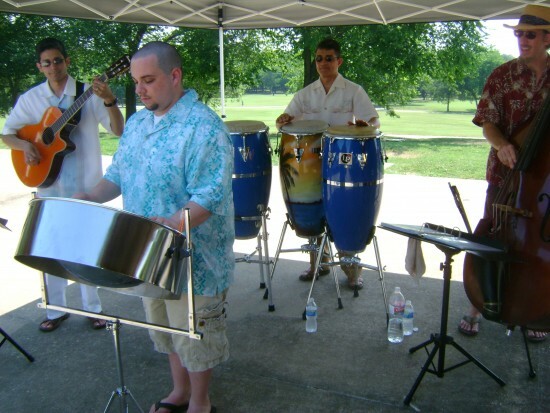 The Island Boogie Steel Drum Band, the premiere tropical party band in the Dallas-Fort Worth metroplex, is the ideal solution for your next private function or themed event! We can infuse any setting with the festive Caribbean sound of steel drums. Our vast collection of tunes is drawn from a variety of popular and tropical styles--including Calypso, Soca, Reggae, Salsa, and Jimmy Buffett--to accommodate your specific musical tastes. As such, Island Boogie boasts the flexibility to project whatever atmosphere your situation necessitates: fun & energetic, light & laid-back, jazzy & cerebral, or anything in between. To fully satisfy your vision for the event, we offer many different entertainment packages, with or without a singer, from an acoustic solo steel drummer to a large show band that is guaranteed to get your party hopping and dance floor shaking. Every performance is custom-tailored to your needs; just let us know what will inspire your audience to boogie! The steel drum or pan as it is called in Trinidad and Tobago is made out of a 55 gallon oil barrel drum. The metal is heated and shaped into the instrument that we play. Because it is metal, the heat from the sun will heat the instrument causing it to go out of tune. For this reason we require any outdoor performance to be in complete shade. In addition, we require one dedicated circuit, that is, an electrical outlet not being shared with pool lighting or a margarita machine, for example.